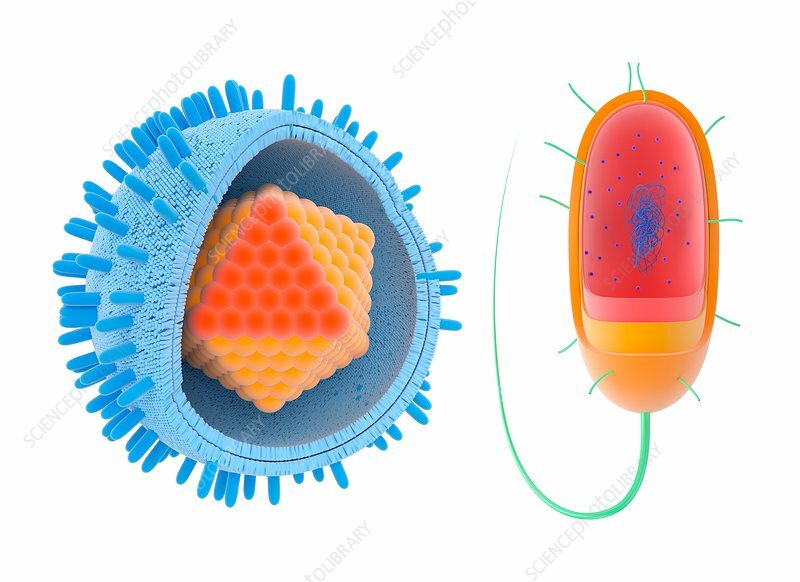 Illustration of a virus (left) and a bacterium (right). This is an enveloped virus particle (virion), consisting of an icosahedral capsid (orange) enclosed in a lipoprotein envelope (blue). The viral genetic material, either DNA (deoxyribonucleic acid) or RNA (ribonucleic acid), is enclosed in the capsid. Bacteria are single-celled prokaryotic organisms. The bacterial cell contains DNA (blue strands), the genetic material, and ribosomes (blue dots), the site of protein synthesis. It is surrounded by a plasma membrane (pink), cell wall (yellow) and capsule (orange). Within the capsule are pili (short green strands), which are used to adhere to surfaces, and a flagellum (long green strand), which is used for locomotion.